Nationally renowned trauma and recovery expert Dr. Tian Dayton gives readers all the tools they will need on their journey of recovery, just as she has for countless of her own patients. Written in the 'I' format, each page speaks intimately to readers, offering straightforward and user-friendly wisdom through inspired readings. This powerful little book will help readers examine their lives and recapture feelings of gratitude and positivity opening to the grace of self-renewal. All I need to do today is to put one foot in front of the other. I can only walk this walk a step at a time. Each time I take a step, I will trust that the next will follow, along with the next, and the next, and the next. What I know today is that no matter what does or does not come my way, I will wake up each morning to one more day of my spiritual journey—nothing more, nothing less. I will keep putting one foot in front of the other. Occasional leaps of faith and periods of unusual progress will no doubt happen as will slips and backslides. But no matter what comes along, I have the gift of recovery in my life, a gift that I can rely on, a gift that means that I never have to struggle alone again. 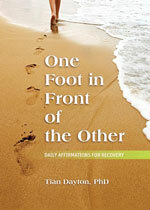 I place my hand in the hand of my Higher Power and together we walk a path of recovery one step at a time. your soul the freedom to sing, dance, praise and love. Today I choose to what I need to do to keep my soul alive, to stay awake to life and to this new day with all of its potential. If I walk by this day without seeing it, I will miss what the day has to offer me. If I rush through it with a preoccupied, distracted mind, I will just get from one thing to the next and the next, till it is over. But if I look, if I understand that being alive in the moment brings unexpected gifts; if I recognize that simply being alive is a gift, then the moments in my day will expand, they will have a feel of something subtle and alive, I will be aware of a deeper pulse of living. There also exists a sleeping sickness of the soul. Its most dangerous aspect is that one is unaware of its coming. which to concentrate, when they can search their inmost selves. so as not to be constantly reminded of what they have lost. But as for you, resolve to keep a quiet time. . . .
out by the hustle and bustle of everyday life. I understand that the quality of my week is influenced by how I live the hours of my day. I will keep it simple today. I cannot solve all of the problems I am becoming aware of overnight, nor do I wish to try. Awareness can hurt. It asks me to become responsible for what I now see, to stop living mindlessly, and to recognize that if my life isn't working the way I want it to, I may need to pull up my shirt sleeves and get messy, to dig my hands into the soil of my day. Awareness can empower me. If I try to make all my life changes at once I may get overwhelmed and want to quit, give up, run away, or self-medicate. Today I will take baby steps. I'll have a simple plan for my day and trust that today well lived will create a better tomorrow. Just for today, I can sit with what I am experiencing right now, I can live my life a feeling at a time. I am learning what it means to live an emotionally sober life. I used to think that emotional sobriety sounded dull, flat, and unexciting. I thought that living in the emotional extremes was living life to the fullest. But today, when I feel the beauty of feeling my feelings without acting out, I have a kind of peace inside that feels good. When I can allow my emotions to fill and inform me, but not control me, I feel my life as it's happening. I experience a new choice. There is a space where I can reflect on what I am feeling before I swing into action. Doing this expands my sense of self and my confidence that I can manage my own inner world. It allows me to live in the moment and to be more spontaneous and adaptable. Living in emotional extremes is a form of acting out or running away from what I feel, running from my manageable feeling center. Emotional balance and sobriety actually allows me to experience a deeper, wider inner world. start searching for different ways or truer answers. ©2013. Tian Dayton, PhD. All rights reserved. Reprinted from One Foot in Front of the Other. No part of this publication may be reproduced, stored in a retrieval system or transmitted in any form or by any means, without the written permission of the publisher. Publisher: Health Communications, Inc., 3201 SW 15th Street, Deerfield Beach, FL 33442.